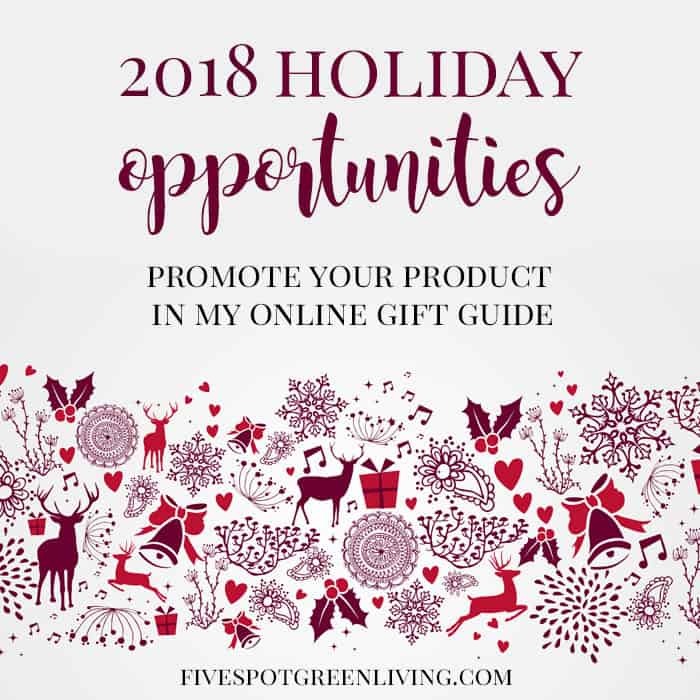 Five Spot Green Living is now accepting submissions for the 2018 Holiday Gift Guide! Submit this form for placement in the on-site gift guide and through social media. The placement includes one product image, description, and link to purchase. The gift guide will be promoted from November 13 through December 20 on Facebook, Twitter, Pinterest, Instagram, weekly newsletter, and includes an individual product post within the gift guide section. Basic placement in the gift guide which includes one product image, short description, and link to purchase. The gift guide will be promoted from October 1 through December 20 on Facebook, Twitter, Pinterest, Instagram, my newsletter, and on-site. Beginning November 1, I will open a giveaway page on my site. The giveaway page will be promoted from October 1 through December 15 on Facebook, Twitter, Pinterest, Instagram, and my newsletter.. You may submit an item for the giveaway. Placement on the giveaway page includes one product image, description of the prize, a link to your site, the terms (e.g. US only, ages 18 and older) and end date. At the end of your giveaway (date chosen by you), I will randomly choose a winner from the comments, collect the winner’s shipping information and forward the information to you. Five Spot Green Living does not accept any responsibility for shipping prizes. All prizes must be shipped to winners by December 20, 2018. For $15, I will submit your giveaway post to giveaway listings and linkies to attract more traffic to your specific prize. This package includes an individual post about your product. If you would like an individual post rather than a basic listing with the product name and link to product, this is the listing for you! This listing will have it’s own post that will be promoted to all social media and out to my RSS and newsletter subscribers of 5,000+. This listing is the best of the gift guide. It contains ALL of the options presented above! You will have a post dedicated to your product which will be promoted to all social media and listed individually on the “Christmas Gift Ideas” page that will be promoted to all social media and out to my RSS and newsletter subscribers of 5,000+. Also included is a giveaway listing and promotion which includes insertion into giveaway sites for extra attention. Can I submit more than one item? Yes! But each item must be submitted separately. Can I send you product in lieu of payment to cover the placement fee? No. If you do not have a budget for the placement fee, you may opt for the giveaway option instead, which is product only. Do I have to pay via PayPal? Yes, at this time I am not accepting payments in any other form. When you click submit, you will be redirected to PayPal and it will say “Five Spot Creative” which is the parent company for Five Spot Green Living.